Happy New Year Trailblazers! The start of a new year is always exciting, especially since it means one thing: The Spring Salesforce release is just around the corner! 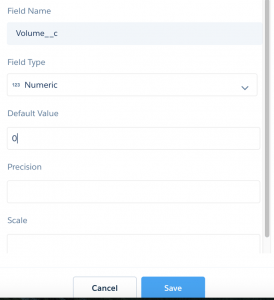 There’s a lot of awesome enhancements in Einstein Analytics this release, and we’d like to highlight our three favorites. These enhancements will transform the way you use Einstein, and make the tool much more powerful for your users. Arguably the most innovative update for this release is the ability to converse with your data. 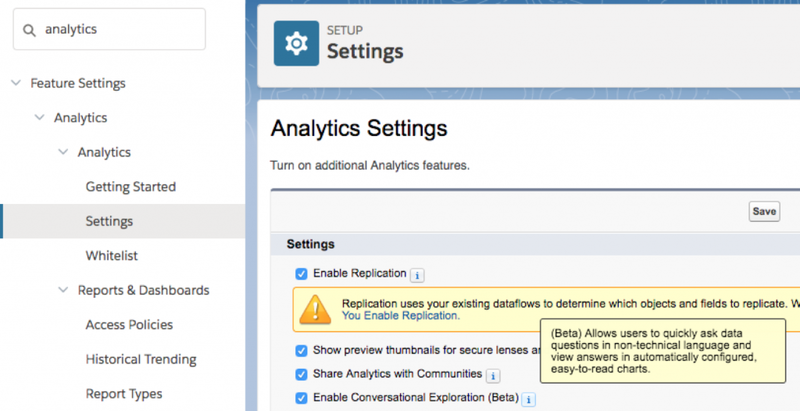 This feature lets users ask specific questions about data and view answers in automatically configured lenses. For example, you could ask something like “what are sales by product name?” or “what are sales current year?” Without a need to develop individual lenses, users can get answers to their critical questions in an instant. Imagine how useful this would be if your manager asks you a question about sales performance out of the blue that can’t be answered by an existing dashboard or lens. To enable this feature, just go to Setup -> Analytics -> Settings. Click the checkbox for Enable Conversational Exploration (Beta), and you are all set. To start conversing with your data, simply open a new lens and start typing a question along the top header section. As soon as you select as question, the lens will be automatically transformed to show your answer! This feature is also available in the edit mode of dashboards. Another awesome enhancement for the Spring release is the ability to annotate data points with Chart Markers. Have you ever looked at a lens and wanted to make a note about a specific data point? For example, you may be viewing a timeline lens that shows a spike of sales in May. This makes perfect sense, since you had a major blowout sale that month which led to the spike in sales. 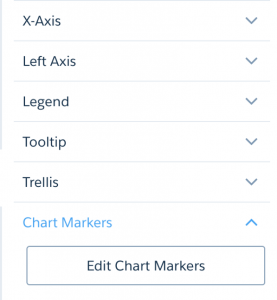 With the new Chart Markers feature, you can specifically point this out to your users. To create a Chart Marker, click on a lens in edit mode of a dashboard. Go to the Widget Properties, scroll down to Chart Markers, and click on Edit Chart Markers. Next, click on a specific data point, like a dot in a timeline chart. In the Widget Properties, you can now edit your Chart Marker. You have the option to show dimensions, measures, and add custom text. In our example, we are going to add custom helpful text. The lens will now show the Marker you added. 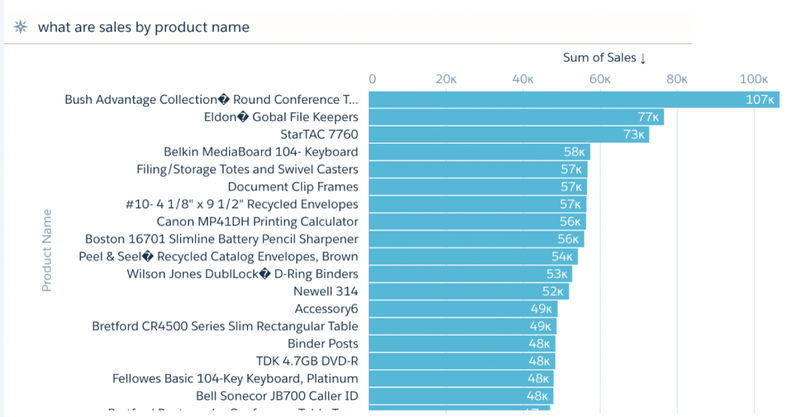 Users will see a helpful message that the month with the most sales was due to a major sale. They no longer have to connect the dots as to why that month had the most sales. 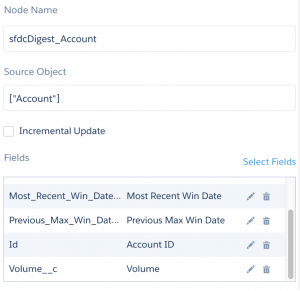 If you are an admin in Einstein Analytics, you probably spend a lot of time in the Dataflow Editor. You may often find yourselves using your favorite JSON editor to make edits you aren’t able to make via the UI. The good news is that the Spring release has taken two major steps to make your life easier. 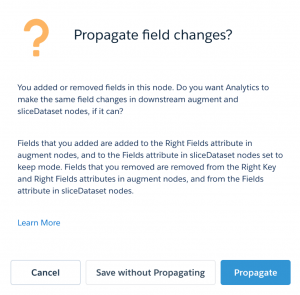 First, Einstein Analytics has added the capability to Propagate Field Changes when adding new fields to a dataflow. 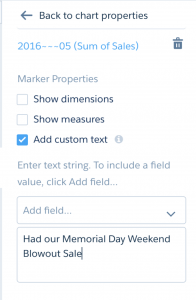 Let’s say you need to add a new custom field to a dataset. Previously, you had to add it to the Extract node, then all downstream nodes manually. Now, you only have to click Propagate when adding a new field through the UI to automatically add it to all downstream nodes. This is a huge time saver! Another major upgrade to the dataflow editor is the ability to add a Default Value directly through the UI. Previously, you had to do this manually through a JSON editor. Imagine you need to add a default value of 0 to a measure field, so that no null results are returned. Just open the digest node in the Dataflow Editor, and click on the pencil icon next to the field you want to add a default value to. Then, enter the Default Value and click Save. You are all done! These enhancements are in alignment with Salesforce vision of making products that are easier to use with less coding. We are eagerly waiting for Spring ’18 release.